Aug. 22, 2018 – As high home prices and a continued inventory shortage in many markets have contributed to the residential real estate industry forecasting a slowdown, the July 2018 ShowingTime Showing Index® revealed waning showing traffic in some regions of the U.S. 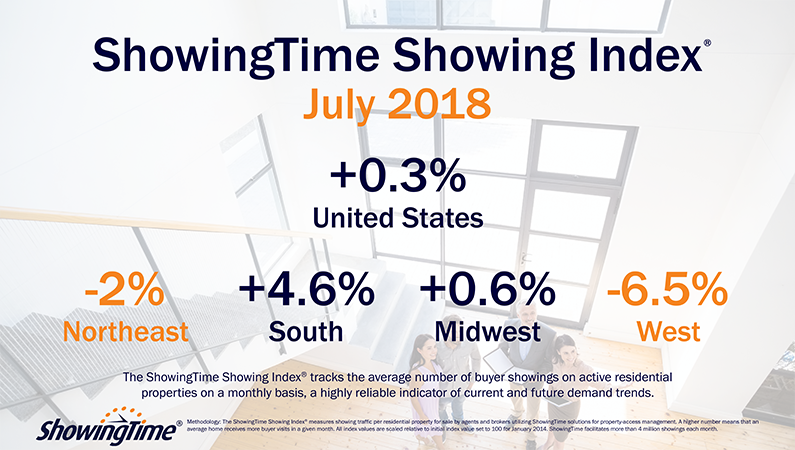 Showing activity throughout the country increased by 0.3 percent year over year in July, the third consecutive month that the U.S. ShowingTime Showing Index recorded buyer interest deceleration compared to the previous year. The June 2018 figures revealed a 0.0 percent change in showing traffic from 2017, while May showed a 1.2 percent year-over-year increase. The 12-month average year-over-year increase was 4.6 percent. The slowdown has been particularly apparent in western markets where inventory remains tight, ShowingTime Chief Analytics Officer Daniil Cherkasskiy said, as showing activity in the West Region has declined for six consecutive months and was down 6.5 percent compared to last year at this time. The Northeast Region has also experienced a run of consecutive monthly year-over-year decreases, with showing activity declining by 2.0 percent compared to last year. Buyer interest remains high in the South Region, however, which has experienced year-over-year increases for 10 straight months and saw showing traffic increase 4.6 percent compared to last July. The Midwest Region showed a slight 0.6 percent year-over-year increase. Released on or around the 20th each month, the Showing Index tracks the average number of appointments received on an active listing during the month. Local MLS indices are also available for select markets and are distributed to MLS and association leadership.